NEW DELHI: The prime ministers of India and Israel reaffirmed their rapidly warming ties and spoke of the “dawn of a new era” Monday as the two nations signed agreements spanning areas such as defense, agriculture, energy and trade following talks in New Delhi. Israel’s Benjamin Netanyahu arrived in the Indian capital Sunday, six months after his Indian counterpart, Narendra Modi, set the foundation for an upward swing in ties when he dropped decades of caution and became the first Indian prime minister to visit Israel. 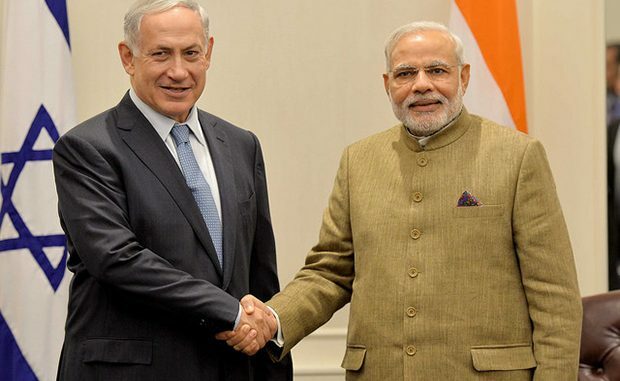 Modi called on Israeli defense firms to invest in India following liberalized rules for foreign investment. India’s decision to cancel a $500 million anti-tank missiles deal with Israel earlier this month was not mentioned. Accompanying Prime Minister Netanyahu is the largest ever business delegation to travel with an Israeli leader, underlining that India’s growing economy presents new opportunities for the country. The 130 executives represent areas such as technology, agriculture and defense. “We remember the horrific savagery in Mumbai. We grit our teeth. We fight back, we never give in,” Netanyahu said, underlining the two countries’ shared concerns about terrorism.